Dr. Lareau attended Kansas State University in Manhattan, KS on a football scholarship where he received his Bachelor of Science Degree in 1974. Following his senior year, he was selected First Team Academic All-Big Eight and First Team Academic All-American by the College Sports Information Directors of America. He then attended The University of Missouri at Kansas City School of Dentistry, graduating with Distinction in 1979. Following dental school, Dr. Lareau moved to Minneapolis for a one-year General Practice Residency, with an emphasis on prosthetic care, at the Minneapolis Veterans Administration Medical Center prior to his residency in periodontics at the University of Minnesota School of Dentistry. He completed his Master of Science Degree in 1983 and received second place honors at the Annual American Academy of Periodontics Balint Orban Memorial Competition for research in periodontics by graduate students. 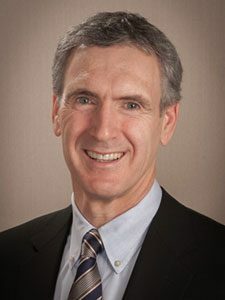 Dr. Lareau has been in full time private practice, recently leaving Centennial Lakes Medical Center in Edina to join Twin Cities Periodontics. He has a number of professional publications, enjoys teaching part-time in the graduate periodontal program as well as periodically presenting to the graduate students in dental specialty programs and to other organizations as well. He is passionate about his profession and continual learning, participates in a number of local study groups including leading a Spear Study Club for the past 8 years. Dr. Lareau’s interests in dentistry are broad. He has trained with many of the leading educators and educational organizations in dentistry including Spear Education, The Pikos Institute, The Misch Implant Institute, gIDE Dental, Seattle Study Club and others. He continues expanding his knowledge and skills development for serving patients and their dentists. He is unconditionally committed to excellence in all that he does. Dr. Lareau and his wife, Sally (who is also a University of Minnesota graduate), have 2 daughters, 4 grandchildren and another "on the way". He enjoys time with Sally and their family and has many hobbies including photography, cycling, cross-country skiing, canoeing/kayaking, backpacking/hiking and, particularly, fly fishing.